A small community in South Carolina is rejoicing after a man was arrested in Miami in connection with a decades-old murder case. In 1996, the accused stabbed his ex-wife 18 times in the chest during a domestic dispute. He then fled to Florida and managed to evade police for 20 years, until he was arrested January 1, 2017 on an unrelated charge. Officials credit advances in technology for connecting the man to the out-of-state crime when he was arrested in Miami years later. Police officials in South Carolina are waiting for the perpetrator to be returned to their home jurisdiction, so they can charge him with murder in the 1996 case. The process is called extradition, and it involves an extradition warrant to legally transfer an accused offender to the custody of a different jurisdiction. What is an extradition warrant? 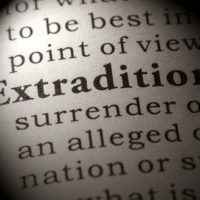 Extradition is the legal process whereby a fugitive arrested in one state is surrendered to another state to face charges. The jurisdiction that’s holding the perpetrator is termed the asylum state, and the one seeking return of the prisoner is the demanding state. An extradition warrant is issued by the demanding state to the asylum state, requesting that the accused be transported to its jurisdiction. Through an extradition warrant, the perpetrator will post bond in the demanding state where the charges are pending. The extradition process can take anywhere from a few days up to one month or more, and the fugitive is incarcerated during this time. How does the extradition bond process work in Florida? If you’re arrested in Florida for a crime in another state, you have three options in the extradition process. Consent to Extradition: If you agree to extradition, you can provide written consent to expedite the process. Challenging extradition is very difficult, so many cases are handled through consent. By doing so, you can be transferred to the demanding state faster – and post bond in that jurisdiction to remain free until trial. Ask for Extradition Bond: A person charged with a crime may request that the asylum state allow an extradition bond, enabling him or her to be free until transfer to the demanding state. By depositing an extradition bond, you are agreeing to appear in all hearings in Florida related to the extradition proceedings. Request Extradition Hearing: Florida requires the demanding state to follow certain procedural rules before allowing extradition. You may be able to contest the demanding state’s arrest warrant and evidence to fight against extradition. Extradition warrants are extremely complicated proceedings that involve complex criminal procedure rules, as well as legal issues involving jurisdiction and due process. It’s critical to retain experienced legal counsel to help you navigate the process and fight for your legal rights. If you’re facing extradition out of Florida for a crime in another state, please contact the Fort Lauderdale office of attorney Kevin J. Kulik. We can schedule a confidential consultation to discuss the details of your case and review different options for defending an extradition warrant.